It Came From YouTube: Andre The Giant and Ted DiBiase vs. Andre The Giant and Ted DiBiase - WrestleCrap - The Very Worst of Pro Wrestling! 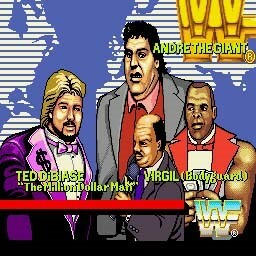 It’s Andre The Giant and Ted Dibiase versus… Andre The Giant and Ted DiBiase in WWF Superstars! Heenan: “Okay, $10 but that’s it!”. Remember, this is the game where Miss Elizabeth checks out your junk when you win! 5 Responses to "It Came From YouTube: Andre The Giant and Ted DiBiase vs. Andre The Giant and Ted DiBiase"
Oh great now I’ve got Mean Gene’s, “Ooooooo!! !” and Andre’s, “Uhhhhh” pinballing back and forth in my brain. Phantom suplex glitches aside the Andre chop and big boot really looked like how he did them. This had to be a insidious plan by DiBisse to hire clone wrestlers of himself and Andre to capture the World World Tag Team Championships. Isn’t that right, Miss Elizabeth? Excuse me, miss, could you at least do me the courtesy of looking at me eye to eye. Okerlund looks like a Klingon. 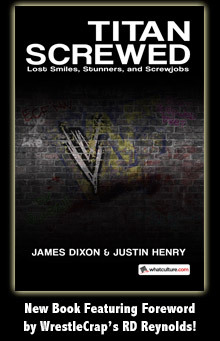 Have you started doing non-wrestling it came from youtubes?